Across a spectrum of possible relationships between modern science and religion, Answers in Genesis is at the end which is characterized by conflict, mutual limitations and exclusions. Answers in Genesis represent Young Earth Creationism, a belief system based on a literal reading of the Bible, which assumes the earth to be about 6000 years old. According to their calculations, the Genesis Flood happened around 4400 years ago, and Answers in Genesis makes it clear that the consequences of the Flood can be observed in the findings of modern geology, biology, and anthropology, only if these findings are interpreted in the right way. Hence, the potential for conflict between their position on science and religion and modern secular science is particularly big. But what exactly is the Ark about for the people who built it? Among the many examples of an ongoing secularization of the United States that Ham mentions in the course of this lecture, faulty depictions of the Ark mark one small but important aspect. 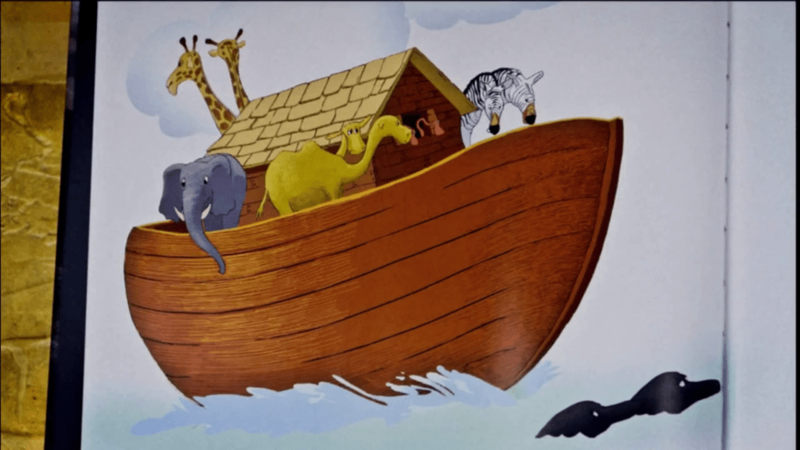 For Ken Ham, unrealistic depictions of the Ark like this are a symptom of a crisis of Christianity. Screenshot from the DVD Ken Ham’s Foundations: Relevance of Genesis (Answers in Genesis 2011). This is exactly the aim Answers in Genesis pursues with its newly built Ark. This focus on the educational purpose of the Ark means that apologetic claims appear in the Ark on multiple levels. Of course, there is always the social-moral aspect. The depravity of mankind that led God to do away with man, save for Noah and his family, parallels many aspects of today’s society. Another aspect, besides the presentation of moral evidence for the Christian fundamentalist worldview, is its rational plausibility check. This aspect is often ignored or polemically discredited in the public sphere and among professional anti-creationists. Nonetheless, it cannot be ignored that the Ark, just like the entire modern creationist movement, constitutes a massive increase in the appreciation of rational evidence for Christian beliefs. In a broad, sociological sense in which the term is used here, “rational” does not mean “true”, but rather something like “internally coherent”, “following clearly expressed rules of thought”, and especially “rooted in phenomena that can be found in this world”. To even deem it necessary to translate the belief in creation into “scientific creationism” is proof of the influence of modern scientific rationality on Christian belief, which, as one might argue from a Christian perspective, is more pure the less evidence it demands. This viewpoint was even radicalized in the history of early Christianity to the point where central doctrines were to be believed not despite, but because they were absurd. The newly built Ark, in contrast to this, is representative of a creationist “factualist hermeneutic style” (Malise Ruthven, Fundamentalism, p. 52). The organization, therefore, practices a sort of reflexive spiritual capitalism: the Ark itself is presented as an attraction, but the entire process is utilized as symbolic capital. The mere interpretation of success (the completion of the Ark) as a divine sanction (God wants the Ark) is already known from Max Weber’s famous studies on the spirit of capitalism. According to Weber, the adherents of the Calvinist doctrine of salvation interpreted their own vocational success, as a sign of being chosen by God and thus more or less inadvertently promoted capitalist tendencies. Answers in Genesis does the same thing, but the organization does not stop there. It closes the circle by interpreting these signs of their own state of grace to acquire more signs of their state of grace. The “innerworldly salvation” keeps itself going to a certain extent, and thus becomes a version of the American “prosperity gospel”. Success breeds success, divine sanction breeds divine sanction, and both permanently refer to, and mutually reinforce, each other. Hence, on a performative level the Ark is deeply connected to general American civil religious values. This is another sign that “conflict between science and religion” by no means is limited to the level of competing theories of explaining the world. The financial aspects of the Ark’s construction especially make it clear that it is not only part of an organization’s struggle for the attention of its audience, but also part of a struggle with other professional players in the science-and-religion controversy in the United States. I have argued in an earlier blog on this website that the wide range of phenomena denoted by the term “creationism” in the United States can be regarded in part as the result of the interactions between professional creationists and anti-creationists. Answers in Genesis’ Ark supports the above argument to the point that it likely would not have been built without this kind of interaction. The organization started the project in 2010, but the actual construction of the Ark was impeded for a long time due to insufficient funds. 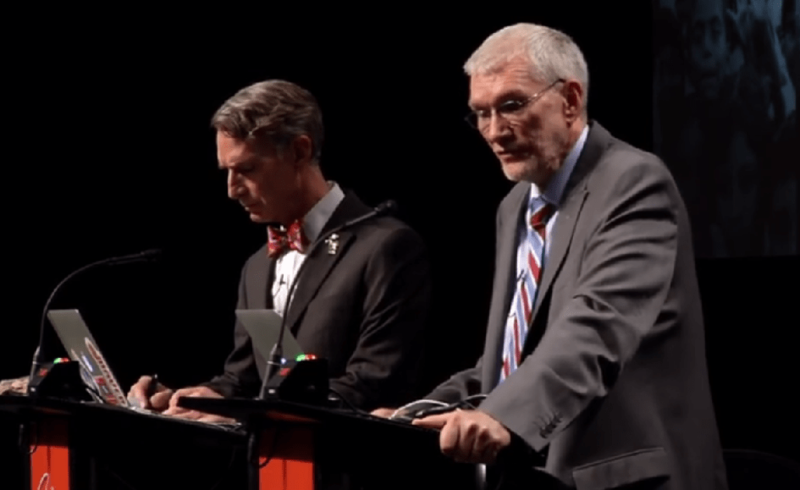 This changed after Ken Ham debated the popular science journalist and presenter Bill Nye on February 4, 2014. The Debate was performed on the premises of Answers in Genesis’ Creation Museum, not far from where the Ark stands today, and it was broadcast live on the internet, with over seven million people watching. Ham managed well during his debate contributions to weave in information about his organization, its purpose, and the Ark. As one consequence of this event, Answers in Genesis was able to sell enough bonds so that the actual construction of the Ark could be announced merely a few weeks after the debate. In this instance, an exchange between professionals enabled the continuation of the conflict at the public level that would likely not have happened otherwise. Answers in Genesis and creationism in general are seen as important exponents of the conflict between science and religion in the United States. Out of many examples of this, a website that features numerous texts dealing with the compatibility of science and religion from a Christian perspective is simply called “noanswersingenesis.org.au”. The analysis of conflict dimensions that become visible in the Ark shows that this generic understanding is at the same time too narrow and too wide. It is too wide, because the mission of Answers in Genesis is by no means the refutation of all of science, or the fundamental opposition against scientific rationality per se. On the contrary, it was argued that the Ark and creationism in general actually represent a certain form of rationalization of religious beliefs. This, is what floats their boat.